I came across a startling statistics which prompted a new line of thinking that I wanted to share – hence this article. Consider these statistics – over 70% of professionals would have worked as a consultant, or will work as a consultant, at some point in their careers. In other words, if you are reading this article, then just look around you, and include people up to 2 rungs below, and up to 5 rungs above you – and think about all those people. About 70% of them have either been a consultant at some point in their careers, or will be. No wonder that with so many consultants around, today, more than ever before, it is extremely difficult to make a choice of the right consultant for your project. So, how do you make sure that you choose the right consultant for the job at hand? Let us start with making an assumption that you have a project, and that you have a choice. That mean that no one is twisting your arm to hire the nephew of the chairman, or best friend of the CEO. And that the body of work is not a forgone conclusion. There are times “when a project is not really a project” – I have written an entire blogpost on this topic. Now, if you indeed have a project, and a choice – you will be in a conundrum. When you go to your boss, or to whoever you go to for funding for the consultant, guess what is the silent CD running inside their brain? A mediocre consulting result does not cut it any more, even in low-performance companies. Clearly everyone (except for your detractors) wants you to find a consulting firm that will indisputably add enormous value that far exceeds what your company pays them. You may not believe this, but most good consulting firms also want you to do exactly the same. Most good consulting companies have more work enquiries than they can actually fulfil – read this blog post if you want to know more about the view from the other side of the table. As a bonus, you will also learn how to get the most out of your chosen management consultants, while spending the least on them. 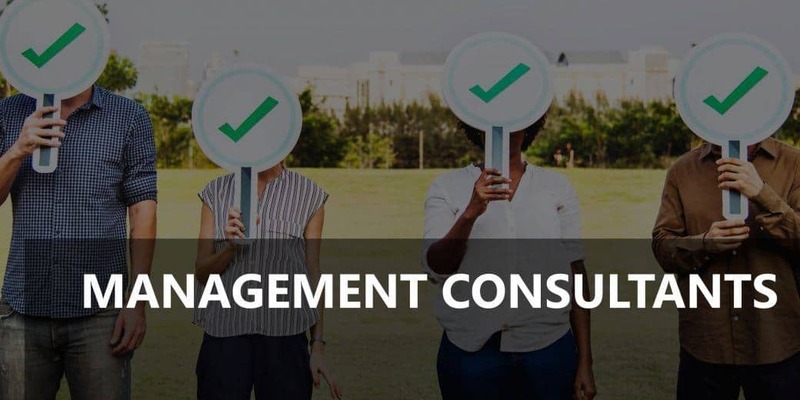 This post will focus on how to choose the best management consultants for the job you have at hand. I could actually give you a step by step formula, but it will be a lot easier to understand if I give you a list of the four most common mistakes, and the wrong things so many people focus on. Once you remove all those common mistakes and wrong things to focus on, all that will be left is a single thing that you should focus on. That will make things so much more crystal clear than any step-by-step set of guidelines. So what are the common mistakes that people make when choosing the right management consultants for their projects? I say this when our longest stretch of client ran for over 13 years because every project is a new undertaking. I kept reminding our teams that we are only as good as our most recent results. No one should have the luxury of resting on their laurels, their brand, or their accident of birth. From a client perspective, there is a slight edge when they do not have to ‘educate’ a consulting firm in their company fundamentals. Yet good consultants come up to speed very rapidly, and are used to fast ramp-up. Any other reason for past relationships is simply invalid and will be covered in the next few points. Many firms regularly tout their experience of over a century in your industry, or in management consulting in general. This sounds enticing. Yet, many of these very same firms struggle on their projects because the senior partners lack knowledge and time, and the junior staff lack direction. your chance of getting good results just based on long established history of the firms is no better than 50-50. Brand is a powerful indicator of quality, and no doubt ensures a certain minimum performance in consulting. But, in this age of disruption and specialisation, does it guarantee the best possible outcomes for your projects. If it was my money, I would do careful due diligence and put it a world class specialist who is top of his/her field and work closely with them, rather than on a vapid branded team who takes over the game and the glory, and hope for the best. By all means ask after these – ask for projects history, testimonials and clients in and outside the industry. But know this – none of them is a guarantee that your project will succeed. I did not want to set out to make an exhaustive list. You could add many other things to the list above – which will be either variations or extensions of the four themes above. And, when you read my two main criteria below, you will agree that only these considerations should decide the right consulting firm for each project. IS HE/SHE GOING TO SPEND AT LEAST TWO DAYS A WEEK ON YOUR PROJECT FOR THE DURATION OF THE PROJECT? The first point is making sure that the expertise of the individual is up to the mark. In this era of internet copycats almost everyone is saying similar things in similar forums. So, try and find unique things that the person is saying (or writing) in public and use your own innate sense to judge them. The second point is making sure of their actual availability for your project. The only thing you are leaving to chance after covering these two points is the actual goodwill and best effort of the person. But, it will really be a low life who will take your money, stay two days a week exclusively working on a project and still not expend full goodwill and best effort on the project. Such a person will not survive for too long as a management consultant, or a world-class expert anyway. In another blog, I have written about How To Get The Most Out Of Your Management Consultants While Spending The Least On Them?